Does Ability sell concrete sealers? Yes, Dy-On-Crete® Mark 2 colours, AQUAdura Clear, Duro-Seel Clear. Our coloured Long Life Paint range can also give a decorative effect without the ‘plastic’ look of a sealer. Does Ability have a sealer suitable for interior use? Yes, Dy-on-Crete® Mark 2, AQUAdura and Duro-Seel Clear. What colours do Ability have in the sealer range? Ability’s Dy-On-Crete® Mark 2 - and it comes in twelve colours. Do we have a sealer suitable for a driveway that is long lasting and guaranteed not to fade and not to peel off? Yes, Ability’s duro paint™ with it’s 20 year guarantee* (*conditions apply) has the durability and qualities required but it does not have the ‘plastic look’ of ordinary sealers. Can you apply a sealer on top of the Paint? Yes, Ability’s AQUAdura, our clear acrylic, would be our recommendation for this application. Does Ability have a ‘wet look’ type of a sealer? Yes, Ability’s AQUAdura and Duro-Seel Clear give a ‘wet look’ depending on the number of coats applied. Dy-On-Crete® Mark 2 can be utilised as a ‘solid’ stain, low sheen finish. Do we have a suitable product for large cracks in driveways etc? 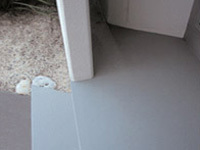 Yes, we recommend Ability’s duro paint™ made with a little less water and trowelled into the cracks. As all projects vary, please call our friendly staff for an estimate based on your requirements. Can you send me a colour card of your range of sealers? Yes, Dy-On-Crete® Mark 2 has a colour chart available within this website or Ability can send one by mail. I want to match a colour - is it possible in your sealer range? Yes, Ability has a minimum quantity order requirement of 10 x 10 litre pails of Dy-On-Crete® Mark 2. Similarily we can match any colour for any of our Long Life Paint range.